Last Sunday we kicked off our December pre-service programming with a fun idea our music department came up with: The Toy Band. The Toy Band was essentially our band performing with toy instruments. 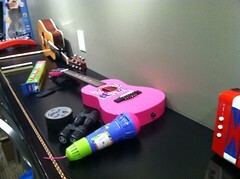 We had three toy pianos, some toy guitars, toy drums, and miscellaneous other toy instruments. As I’m sure you can imagine, there were some challenges that came with this. I found out about the idea about three weeks out and knew the hardest thing was going to be the monitor situation. Monitors is an area right now that I consider to be one of our bottle-necks because we’ve outgrown our capacity there. On a typical Sunday we’ll have on average 7 people on stage which maxes out our stereo IEM mixes on our current console. We can cheat the desk a bit to turn the 4 remaining mono mixes into two stereo mixes, but it’s pretty clunky. For this particular week, I knew I was initially looking at 10 people on stage, and it only grew as Sunday got closer. In the end we had 17 people on stage. My first step in preparing was to whittle down the number of musicians that actually needed monitors as much as possible. Some of the people weren’t playing critical parts or were there to simply add energy to the band which helped condense the need a bit. Then it was just a matter of gathering enough packs for everybody and figuring out a logical way to share mixes; for example, I tried to group percussion instruments together. We had a few spare packs that I gathered, and then Luke down at Buckhead was kind enough to loan me some more. In the end, though, it didn’t matter because once the band started rehearsing, they decided they didn’t need monitors since all of the instruments were acoustic and the combination of stage sound and PA was all they needed. That’s just the way it goes sometimes. You can plan all you want, but you still need to improvise. 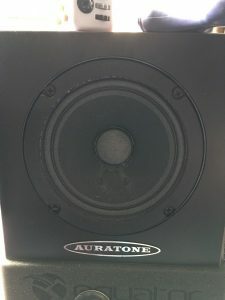 I think we were all actually relieved the band opted to skip monitors this time because sometimes there is a great divide between making something work and making something great, and I truly believe that monitors should be great for musicians whenever possible because I want them to be inspired by what they hear. With 17 people on stage came 17 instruments, but fortunately not all of them needed to be mic’ed. The first step was finding inputs. I was able to grab some inputs from service elements that weren’t happening that day like our dedicated welcome mic and baptism mic. The rest of the inputs came from compromising some of our other inputs. For example, we typically have 8 tracks coming from a laptop on stage, but this week we didn’t need all 8 so I was able to steal some of those inputs. The final inputs were co-opted from some of the vocal mics already in use for the morning. I ended up using a total of 14 inputs for the entire toy band. Next up was figuring out how to mic everything up so it would be easily struck since the entire band needed to be removed after the set. So the next challenge was making as much of the band wireless as possible. 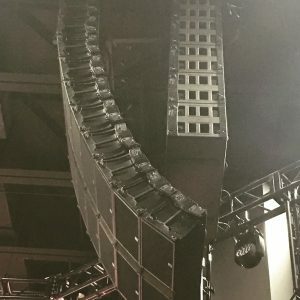 I have 20 channels of RF mics available between my two auditoriums. Some of these channels are handhelds and some are beltpacks, but some have the option of being handhelds or beltpacks so I was able to program some of our spare beltpacks to typical vocal mics to make the band happen. With the exception of the drums, I was able to make everything wireless. For those of you doing the math, that’s 13 channels of RF dedicated to the toy band. 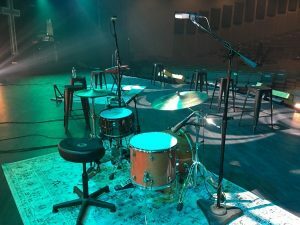 In terms of mics, the drums received a single KSM44 placed just in front of the kit which our crack audio crew struck after the final toy band number. I opted to put it in front instead of overhead because I wanted to make sure I was getting the kick drum. The vocal mics ended up on things like kazoo’s, horns, harmonics, shakers, etc.–basically, anything that didn’t need a mic attached. I then used DPA 4061’s on the toy pianos, guitars, and a toy xylophone. We originally added the 4061’s to our collection to mic string players, but I have yet to find something it won’t work on. It’s just a very versatile mic that sounds great. Plus, the kits we have feature a variety of ways to mount the mic on things so it was very easy to stick the mics to the instruments. The final instrument mic was a DPA 4099 I borrowed from Luke down at Buckhead to mic the toy accordion, but in retrospect I think another 4061 might have worked better since it would have been easier to mount. My favorite thing we did, though, was the toy vocal mic. Reid Greven on our music staff took a toy mic and hollowed it out so that we could fit one of our RF handhelds in it, but that gave me another idea. 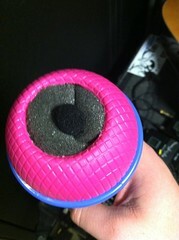 I drilled a bigger hole in the bottom of the mic and ran a Countryman B3 lav up into the head of the mic. When we first started using it, the resonance of the plastic body was driving me nuts so a couple of our audio crew found some foam and stuffed the cavity of the mic with it. A windscreen on the mic finished it off. On camera and in the house, it looked like Chrystina was singing into a plastic mic. In the end, the biggest challenge was probably the mix itself. On the one hand, we wanted it to sound good, but at the same time these were toy instruments so they needed to retain that quality. I tried to approach this as something that should sound so bad it’s good. The first issue, however, was gain before feedback. With 14 open mics downstage everything was right on the edge of feedback. My initial attempt to deal with this was to try and kill things on individual inputs with channel EQ, but in the end I opted for assigning the toy band instruments to a single stereo group and strapping a parametric EQ across it. With the mics opened up, I was able to quickly eliminate the feedback issues with a few minor cuts on the group EQ. This is typically my preferred way of dealing with feedback because then it then leaves the entire channel EQ for tonal purposes. 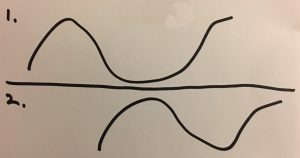 I also prefer a parametric here as opposed to a graphic EQ. I’ve found with a graphic EQ it’s a lot easier to end up in a downward cycle of cutting too many bands to fix issues which ultimately ends up in broadband attenuation of the signal. A parametric lets me zero in on problem areas with a smaller number of filters that I think also sounds better. The next challenge was more tonally related. Since the instruments were toys, they tended to be brighter and sometimes harsh, and the number of instruments on stage exacerbated the issue. This time I went after the hurt frequencies on the brighter individual instruments like the toy pianos to tame things. The other solution was really to just keep the volume at a reasonable level. It was a toy band playing pre-service and not our typical rock band so it didn’t need the same oomph of our music sets. I used high-pass filters judiciously, but overall processing on the inputs was kept very light with a little bit of EQ here and there. I ended up filtering the toy strat a little more than I would a typical guitar to try and make it sound smaller. 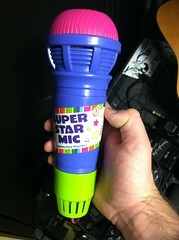 One of the guys on my crew also mentioned the fake vocal mic didn’t sound enough like a toy. To make it more toy-like, I inserted a Waves C4 and solo’ed the upper-mid band. I then ran it through the Waves Meta-Flanger and added a bit of delay to give it some cheeseball toy effects. We had a lot of fun with the toy band. The last piece of the puzzle was we handed out kazoo’s to all of our guests that morning so for the final song everyone in the room was able to join in with the band. 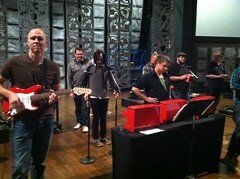 If you missed the Toy Band live during our online service, I have embedded video of it below for your enjoyment. If you have any questions about this, please post them in the comments below. Fantastic job and it sounded awesome and it was very well recieved by the audience. Nice job Dave, you definitely achieved the desired effect! Dave, I was off last Sunday and actually got to watch this unfold live. It was fun. I wanted to ask about Chrystina’s mic, thanks for explaining that. I have to admit, I’m disappointed, haha. I was hoping you had shoved a lav in the BOTTOM of that mic to get the nice effects that come with it. My daughter has one at home, I know its sound all to well. Did you throw an EQ on it to make it go low-fi or anything? For her vocal, I put a Waves C4 multiband comp/EQ on it and solo’ed the upper-mid band. I think I dragged the limits of the band out a bit, but this was like filtering out everything below maybe 500-700 Hz and everything above like maybe 4k. Brilliant! Simply brilliant throughout! To have pulled that off so well, means that everyone had to contribute their gifts equally and unselfishly. This confirms that God has a fantastic sense of humor. Keep em’ coming Dave! We FOHs and others always benefit from your blogs.